Sometimes, one person’s clothing hook is another person’s elephant trunk. 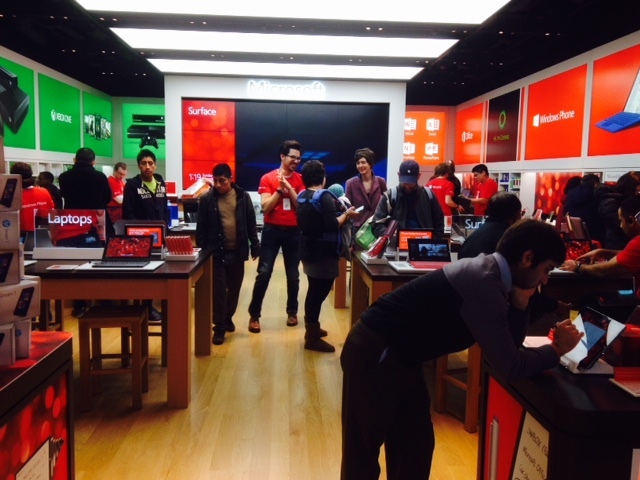 So Microsoft has tried to do the copycat thing of the Apple Store. See Apple (top photo) streaming with customers trying out their world-class computers and smartphones yesterday. See Microsoft (photo underneath) just a few storefronts down in the mall with nice vibrant colors, but just a handful of customers (the non-red shirts) in the entire place. BTW, I took a look at the iPhone 6 Plus and liked the size (I thought I wouldn’t) and ordered one (will be nice I hope to actually see the screen on this thing). At the same time, I tried the Microsoft Surface, and my wife says to me can you videotape me showing how long it takes to actually try to figure this thing out–piece of garbage! It was also confusing why the Microsoft store was selling Dells and other companies computing devices–Ah, maybe because they don’t have anything competitive of their own??? Microsoft great try with the overall store (Touche!) but you just don’t have the retail products to compete with Apple–and the piles of Xbox in the rear of the store to draw people in–that wasn’t working either. I have always been intrigued by simple solutions to complex problems. Bloomberg Businessweek has a great example of how a Fulbright Scholar studying in Beijing solved the smog problem for many people wanting to reduce the danger to themselves and their families. Air Filters that purify the air can cost around $800, and often one is needed for each room. But Thomas Talhelm founder of Smart Air Filters found he could do the job with a simple HEPA filter, fan, and velcro strap to hold them together for just $33/kit. He tested the results and found that he could remove 90% of particles 2.5 microns and above in the room. Talhem’s biggest problem now are copycat DIY air filters hitting the market. If only inventors could come up with a simple solution to protecting intellectual property in places where either there aren’t rules or they aren’t strictly enforced. This is a photo I took at Harpers Ferry. 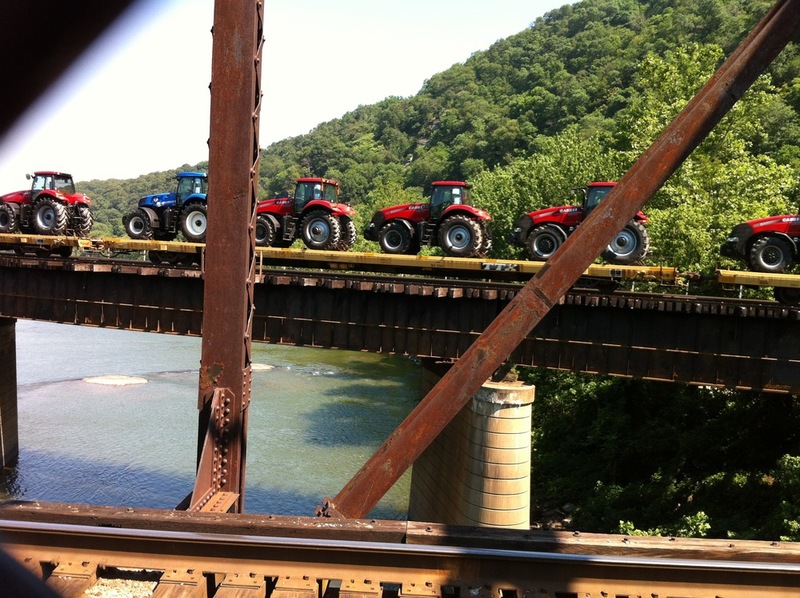 There was a train coming by pretty fast, and on the flatbeds were what seemed like a endless line of Tractors. — Red, red, red, red, blue, and then red again. I hurried to get my iPhone out and capture this photo while the train was rushing by at full speed. I love this shot, because it teaches an important lesson about diversity. From early in life, we are taught to conform a certain way–based on norms, culture, values, policies, rules, regulations, laws, religion, and so on. There always seems to be a reason that we have to talk, dress, think, and conduct ourselves–properly, politically-correct, and just like everyone else. And we are warned that “the nail that sticks out, gets hammered down”–so don’t do it–it’s too risky–you’ll be labeled bad or worse yet, crazy. But in this picture, the tractors tell a different story–that it’s okay to be a blue tractor in a long parade of red ones. No, the blue tractor wasn’t a mistake, it isn’t abnormal or alien or evil, it’s just different and it’s cool. The blue tractor stands out, but it isn’t a bad thing to stand out–and the blue tractor won’t get hammered down. It’s okay to be a blue tractor in a long procession of red tractors–and it’s great to just be who you are–blue, red, yellow, green, or whatever. Conformity is not normalcy–it’s just look-alike, copycat, and probably even boring. Being different can be novel, inventive, out-of-the-box and exciting–and more important it can usher in needed change. I think we need more blue tractors in a red tractor world. Will you take a chance and be a blue tractor too? With the Facebook IPO scheduled for this week, valuing the company at as much as $96 billion, many investors according to Bloomberg BusinessWeek (11 May 2012) see this as overvalued. Facebook will be the largest Internet IPO in history, and would be about 4 times as much as Google was valued at its IPO at $23 billion in 2003. Further, Facebook could be valued at offering at 99 times earnings. This is more than the price earnings ratio of 99% of companies in the S&P Index, yet even with some estimating sales of $6.1 billion this year, Facebook would only rank about 400 in the S&P 500. True Facebook has amassed an incredible 900 million users, but the company’s revenue growth has slowed for the 3rd year in a row. Another article in BusinessWeek (10 May 2012) describes a new social networking contender called Diaspora. Unlike Google+ which is predominantly a Facebook copycat, Diaspora is bringing something new and major to the table–they are addressing the privacy issues that Facebook has not. Diaspora is a distributed (or federated) social network, unlike Facebook which is centralized–in other words, Diaspora allows you to host your own data wherever you want (even in the cloud). Each of these independently owned Diaspora instances or “pods” (dispersed like in the Diaspora) make up a true social “network”–interconnected and interoperable computing devices. With Diaspora, you own your own data and can maintain its privacy (share, delete, and do what you want with your information), unlike with Facebook where you essentially give up rights to your data and it can and is used by Facebook for commercial use–for them to make money off of your personal/private information. When it comes to personal property, we have a strong sense of ownership in our society and are keen on protecting these ownership rights, but somehow with our personal information and privacy, when it comes to social networking, we have sold ourselves out for a mere user account. As loss of personally identifiable information (PII), intellectual property, identity theft, and other serious computer crimes continues to grow and cost us our money, time, and even our very selves in some respects, alternatives to the Facebook model, like Diaspora, will become more and more appealing. So with social networks like Facebook–it is a case of love it, but leave it! 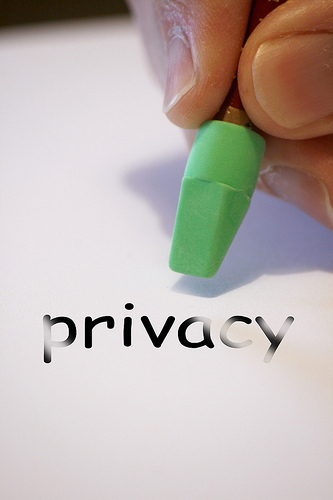 Love social networking–especially when privacy is built in–and others don’t have rights to what you post. But leave it–when they are asking for your investment dollar (i.e. IPO) that could be better spent on a product with a business model that is actually sustainable over the long term. Yesterday, a hyped-up video came out by Google on Project Glass. Basically this is Star Trek-type glasses that provide everything that’s on your smartphone plus some augmented reality, where real world sensation is augmented with computer-generated information. The video shows the glasses integrated with functionality for email/messaging/phones calls, photos/videos, music, reminders, weather, maps/directions, transportation updates, and more. Aside from the integration into the glasses themselves, they really didn’t demonstrate any major new technologies–and was sort of disappointing actually. It reminds of Google+, which came out and didn’t add anything much new over FaceBook, and hence hasn’t really caught on–copycatting just isn’t enough in the high-tech industry, where real innovation is what’s valued. While I like the idea of more and better ways of getting the types of information and functionality that’s on your smartphone, I really don’t think glasses is the way to go. Frankly, after having LASIK surgery more than 12 years ago, I am so happy not to have to wear those obtrusive frames on my face anymore, and I certainly wouldn’t want to go back. I would envision having these functions either built microscopically into contact lens or projected by mini-wearable cameras in front of you as a true reality overlay–and I think Minority Report thought of that one first.